Give customers an easy option to pay over time while you get paid straight away. Customer selects Flexi-Fi as payment option and provides their mobile number. No further information is required. Customer pays first instalment or application fee upfront (depending on plan) and gets their goods/services straight away. Flexi-Fi settles up-front with the retailer and assumes any risk. Customer pays off their purchase over their chosen instalment plan directly to Flexi-Fi. Flexi-Fi converts customers that would have otherwise abandoned, generating more sales from existing customer base and creating new customers. 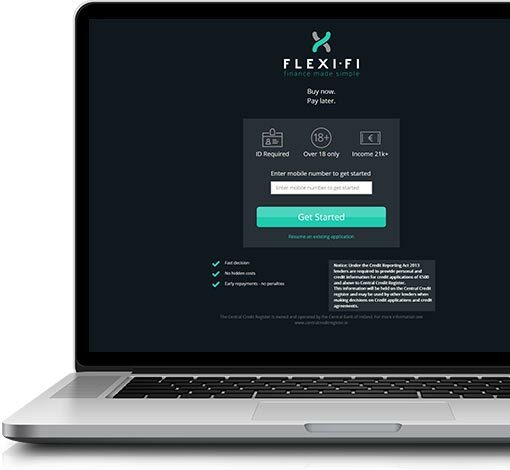 Flexi-Fi settles with the retailer quickly and automatically. Flexi-Fi customers spend more per transaction and over their lifetime and repeat their purchases more often. Flexi-Fi assumes all risk associated with customer payments for every single transaction. Flexi-Fi is one of the most flexible point of sale finance offerings for your customers in Ireland. To find out more on offering point of sale finance to your customers, please provide us with your details below and a member of our Flexi-Fi team will be in touch.